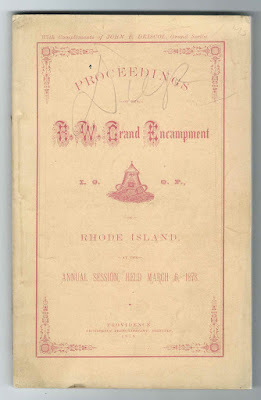 Memorial page for Horatio Lewis Holmes, included in the 1878 Proceedings of the Annual Session of the Right Worthy Grand Encampment of Rhode Island for the Independent Order of Odd Fellows. Frederick D. Stuart, born July 12, 1814 at Brooklyn, New York; died January 25, 1878 at Washington, D.C.
Born in Lexington, Mass., October 24, 1815. 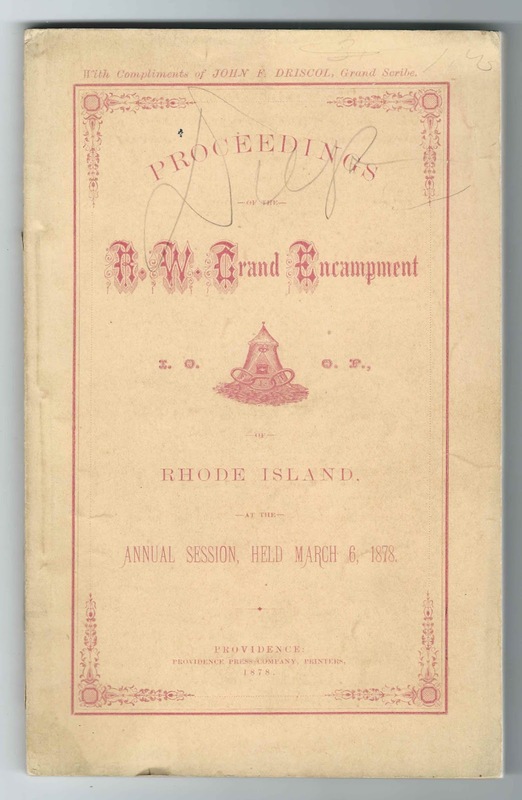 Came to Providence, R. I. in 1835. Died in the City of Providence, R. I., January 9, 1878. According to the memorial page, Horatio Lewis Holmes was born October 24, 1815 at Lexington, Massachusetts. 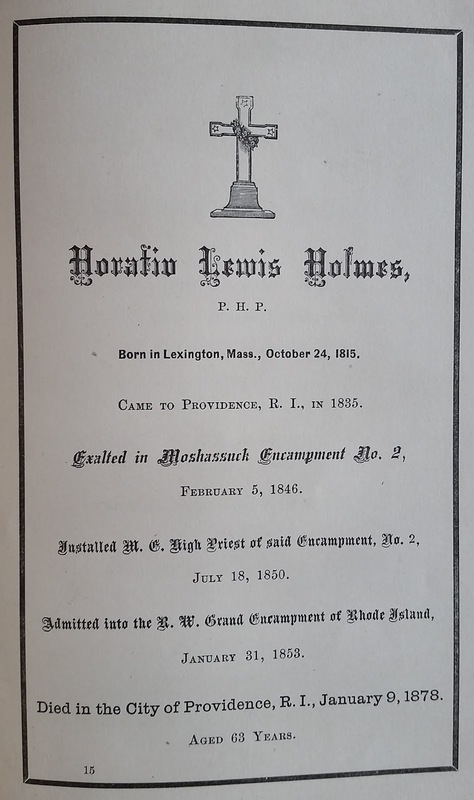 A Massachusetts birth record confirms the date but places the birth at Kingston, Massachusetts and names Horatio's parents as Lewis Holmes and Sophia Holmes. 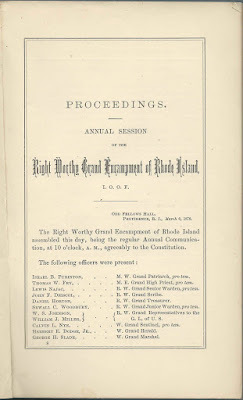 An entry on Ancestry.com, gives an incorrect birth year of 1813, which is readily cleared up by reading the referenced document itself. I'm not sure if Horatio lived at Lexington, Massachusetts for a while, or if he had no connection with Lexington at all. 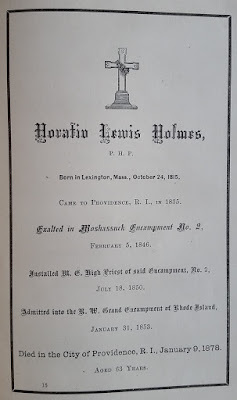 The Brewster Genealogy, by Emma C. Brewster Jones, includes a Horatio Lewis Jones with a birth date and place of October 24, 1815 at Kingston, Massachusetts, son of Lewis Holmes, Sr., and Sophia (Holmes) Holmes. Unfortunately, Emma has poor Horatio as dying on February 5, 1842, the same death date as that of his first wife Mary Gladding Holmes, despite the fact that Emma also notes that Horatio married his second wife Nancy Hardenbeurg on November 25, 1845. Horatio's death date of January 9, 1878 is correct, according to multiple sources. Consequently, what I've determined is that Horatio Lewis Holmes was born at Kingston, Massachusetts, on October 24, 1815, the son of Lewis Holmes and Sophia (Holmes) Holmes. According to the Brewster Genealogy, on September 30, 1840, Horatio married Mary Gladding of Providence, Rhode Island. Mary died on February 5, 1842. I don't know if Horatio and Mary had children or if Mary died in childbirth. Also according to the Brewster Genealogy, Horatio married Nancy Hardenbergh of Providence, Rhode Island, on November 25, 1845. Horatio and Nancy had, I believe, at least two children, one of whom died in infancy. 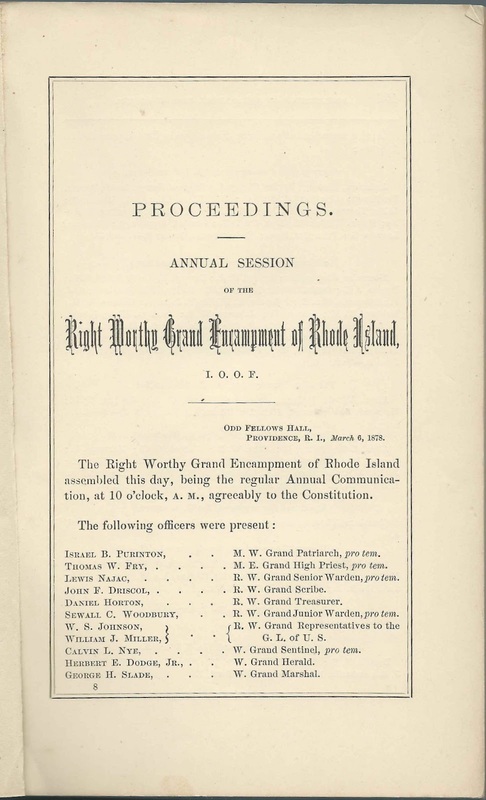 According to an 1870 report of the Board of Water Commissioners of Providence, Horatio was hired at an annual salary of $1500 to inspect the city water pipes. Horace and his brother-in-law Fayette Hardenbergh received a patent in 1877 for a top-roll support for spinning machines. Horatio and his two wives are buried at Swan Point Cemetery at Providence, Rhode Island.